We have a dedicated team of friendly, hard working volunteers but welcome new helpers for our sessions on Tuesday or Friday mornings during term times. No experience is necessary, with children or horses, as we will provide training but we do need to follow up two references and a DBS (Disclosure and Barring Service – formerly Criminal Records Bureau) check. 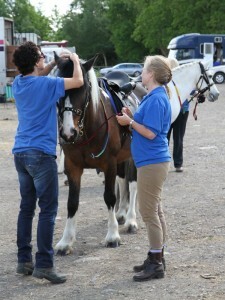 Depending on your interests, you could help with grooming and tacking up, leading, helping the riders on with hats etc. or side-walking alongside the children during the ride. 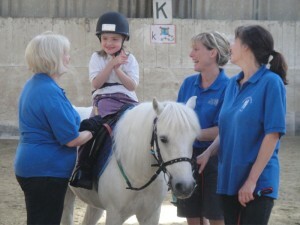 Seeing the enjoyment of the riders and the different ways each child benefits is very rewarding and lots of our volunteers have been with us for many years!